"The first thing that struck me about Dede Wilson’s The Birthday Cake Book was how incredibly colorful it was! I already trusted that this book would help me create beautiful cakes because of the painstaking effort the author put into the book’s design. As I started to browse through, I was amazed at how thorough and dedicated the author was in making sure your cakes are the talk of the town! On page 15, she provides a step-by-step guide to creating this elaborate rose out of frosting—just like professional bakers. Additions like these make this cookbook so much more appealing than so many cookbooks on the market. The cakes themselves look so delicious that it made me want to reach through the pages and take a bite! There’s even a convenient glossary in the back that sorts the cakes by categories, such as flavors, holidays, and much more!" 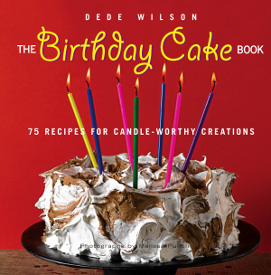 "With over 70 recipes for special cakes that will make your celebration unforgettable, Dede Wilson's The Birthday Cake Book cookbook is the best gift you can give to any inspired baker. The first chapter, making Baking, and Decorating Fabulous Birthday Cakes, covers the basics of what you'll need in order to make a memorable cake. From ingredients to cake pans, Wilson explains the importance of everything. They always said baking was a science. Whoever thought science could be so fun! Wilson will inspire you to bake a delicious cake for your birthday boy or girl. She guides you how to properly decorate your cake with the best frosting and to be creative with your recipes. With recipes like the Espresso Hazelnut Dacquoise to the Mocha Toffee Crunch Cake, there is something for everyone. It's time to get enthusiastic about birthdays and start baking. After all, a birthday only comes once a year. Make The Birthday Cake Book part of your collection." "Dede Wilson's The Birthday Cake Book is one of the most detailed and unique cookbooks on cake I've ever come across. With over 75 recipes there's something for everyone who's special in your life. I loved the 10 tips for successful baking section and tips on frosting cakes. There are so many great tips in this book actually, so for anyone's who's just starting out in this whole baking arena this book is essential. As for the recipes you'll find everything under the sun, like the Dark Chocolate Cake (pg. 30), which I can't wait to make, or the super simple Quick n' Easy Chocolate Cake (pg. 31), which is perfect for beginners. Along with the simpler recipes there are also so many unique cakes to challenge and inspire even the expert baker; plus the photos are beautiful! There's even a recipe for The Birthday Cake You Can Mail (pg. 70), how unique is that? Wilson's book would make a great gift to anyone who loves baking to even the biggest novice." "I would have never thought that birthday cake baking was a topic worthwhile of its own cookbook, but that was before I opened up The Birthday Cake Book by Dede Wilson. I'm not a baker by any stretch of the imagination, but a sizable number of the recipes looked easy enough for even me to make. For experienced bakers, there are plenty of more intricate and visually dazzling baking ideas in here as well. In addition to the clear and concise recipes, this book contains dozens of helpful tips from cake decorating to storage and more. After perusing this cookbook, even non-bakers will want to break out their baking equipment. No birthday is complete without a cake, and this cookbook shows you everything you need to know to add that homemade touch for your next birthday celebration." Enter AllFreeChickenCasseroleRecipes' Facebook giveaway for your chance to win this book, included in our 3 Cookbooks + Cricut Cake® Giveaway!